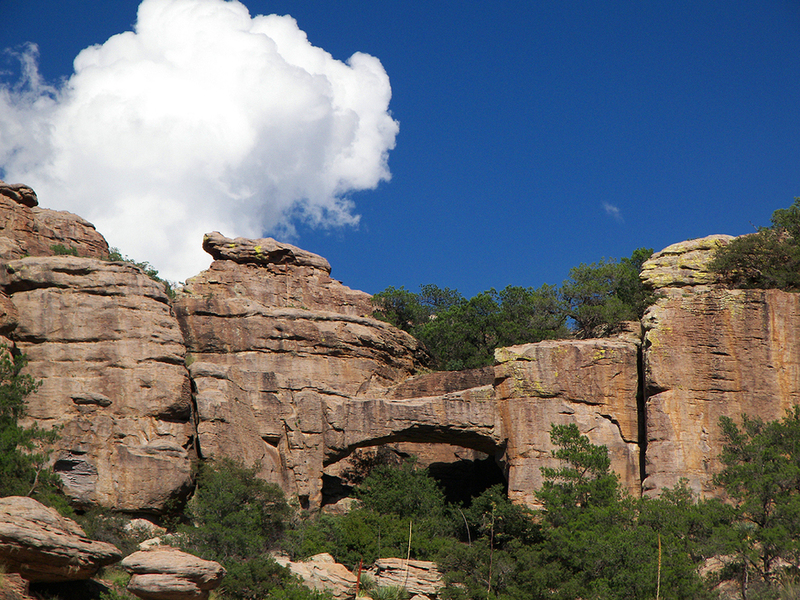 Natural Bridge Trail - Chiricahua N.M. 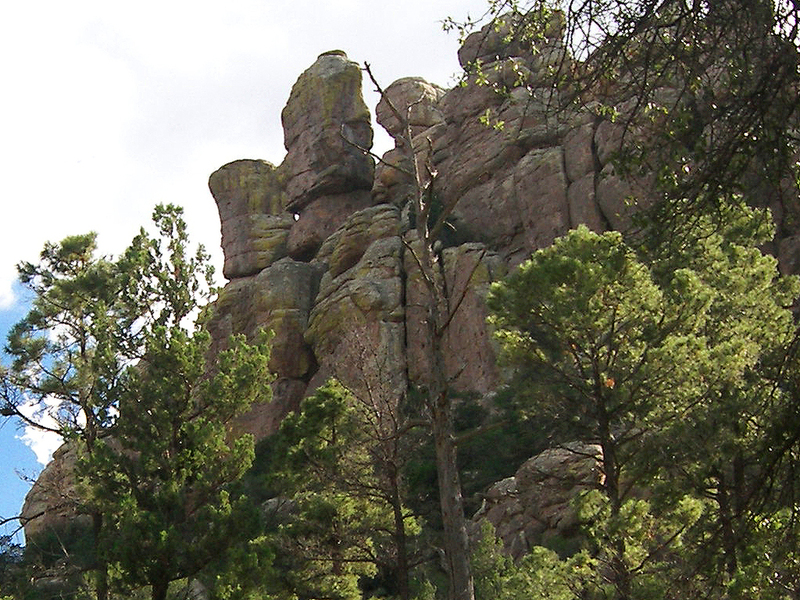 The highlights of this lightly traveled trail at Chiricahua National Monument are a natural bridge, a pine filled valley hidden between fascinating rock formations, and a wilderness experience a world away from the crowds at Massai Point. The Natural Bridge Trail begins at a small pull off along the road to Massai Point. The trail takes off right next to a large trail information sign, and immediately crosses Bonita Creek. Once across the creek, the trail begins a steady climb up the oak and cypress filled bottom of North Bonita Canyon. Around 0.6 miles, the trail begins climbing a rocky slope out of the canyon. Now free from the tree cover, you'll get your first good views of hoodoo filled Bonita Canyon. After a short climb, the trail reaches its high point on top of an oak and manzanita covered mesa, where the trail levels out for a time. The high point of the Monument, Sugarloaf Mountain, rises up behind you, while the Sulphur Springs Valley comes into view to the west. The trail gently descends to the west across the mesa, before encountering a short series of switchbacks that take it into the upper end of Picket Canyon. Now in Picket Canyon under a canopy of silver oaks, the trail begins to curve to the south, and enters the hidden valley of Picket Park. 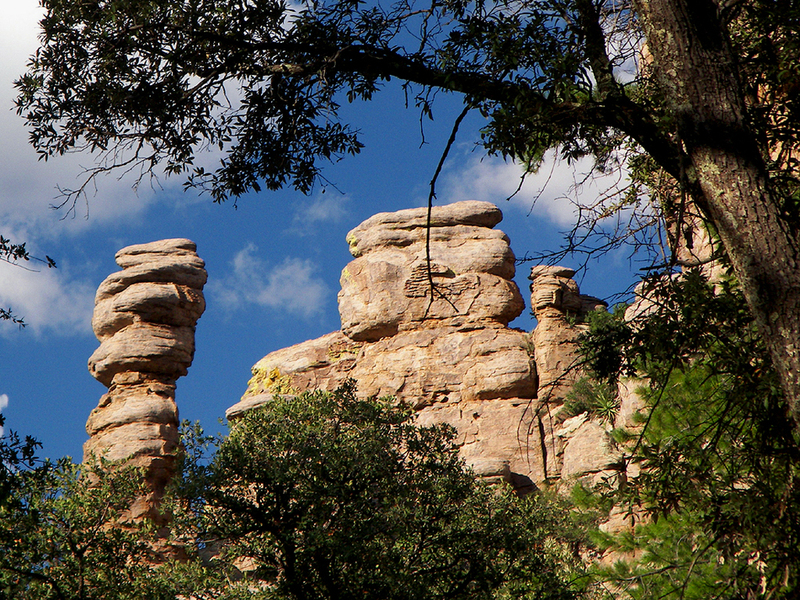 This Chiricahua jewel is indeed park like, with its open stands of apache pines, and carpets of summer wild flowers. The tiny cones of chihuahua pines litter the ground, and the whole area emits a rich pine fragrance. Bizarre totem pole spires and abstract stone faces reminiscent of Easter Island tower high above the park, as you make your way south through this hiker's paradise. As the trail heads south out of the park, it emerges from the pine forest, and begins climbing up a sandy wash. The entire canyon soon comes into view, revealing an endless array of oddly shaped pinnacles that stretch into the distance. The Natural Bridge Trail soon comes to an end on a rocky shelf on the west side of the canyon. Native bedrock provides seating at this tiny overlook. A sign points to the sheer eastern wall of the canyon, where a stout, arching, natural bridge of volcanic rock is nestled high above among the lichen covered cliffs. Unfortunately, the trail doesn't go up to it, but one needs only a telephoto lens to get close. Claim a slab of rock for yourself, kick back, and rock out with nature! From I-10 exit 340 in Willcox, head south on highway 186 for about 33.2 miles to highway 181. 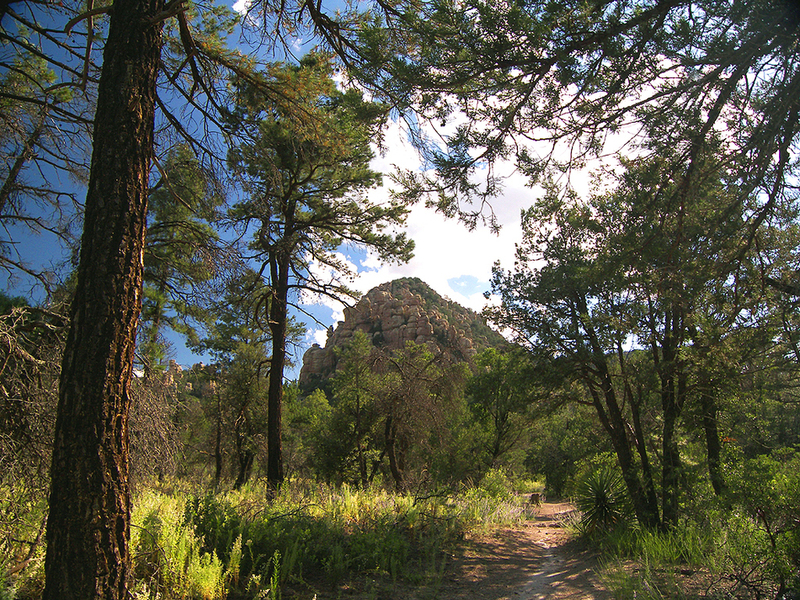 Turn left (east) onto highway 181, and follow it for 3 miles to the Chiricahua National Monument entrance. (There is an entrance fee) Follow the highway for approximately 3.3 miles beyond the Monument's entrance to the sign for the Natural Bridge Trail, on the left side of the road. (The trailhead is 1.25 miles past the Visitor Center). 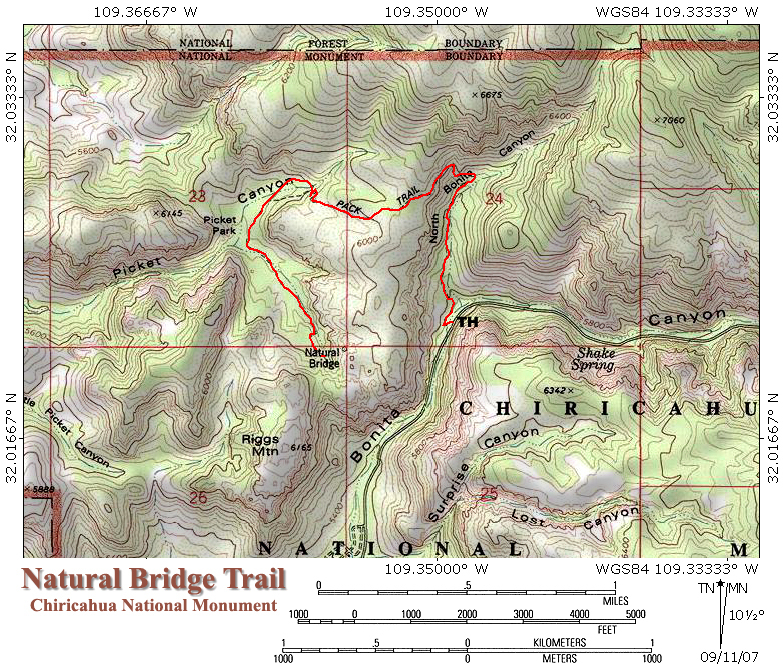 The Natural Bridge Trail starts next to the large trail information sign.